As part of my new role as Lecturer in Agri-data analysis at Harper Adams University, I found myself applying a lot of techniques based on linear modelling. Another thing I noticed is that there is a lot of confusion among researchers in regards to what technique should be used in each instance and how to interpret the model. For this reason I started reading material from books and on-line to try and create a sort of reference tutorial that researchers can use. This post is the result of my work so far and I will keep updating it with new information. Please feel free to comment, provide feedback and constructive criticism!! where β_0 is the intercept (i.e. the value of the line at zero), β_1 is the slope for the variable x, which indicates the changes in y as a function of changes in x. For example if the slope is +0.5, we can say that for each unit increment in x, y increases of 0.5. Please note that the slope can also be negative. The last element of the equation is the random error term, which we assume normally distributed with mean zero and constant variance. In this case the interpretation is a bit more complex because for example the coefficient β_2 provides the slope for the explanatory variable x_2. This means that for a unit variation of x_2 the target variable y changes by the value of β_2, if the other explanatory variables are kept constant. notice the interaction term between x_1 and x_2. In this case the interpretation becomes extremely difficult just by looking at the model. we can see that its slope become affected by the value of x_2 (Yan & Su, 2009), for this reason the only way we can actually determine how x_1 changes Y, when the other terms are kept constant, is to use the equation with new values of x_1. This linear model can be applied to continuous target variables, in this case we would talk about an ANCOVA for exploratory analysis, or a linear regression if the objective was to create a predictive model. The Analysis of variance is based on the linear model presented above, the only difference is that its reference point is the mean of the dataset. When we described the equations above we said that to interpret the results of the linear model we would look at the slope term; this indicates the rate of changes in Y if we change one variable and keep the rest constant. The ANOVA calculates the effects of each treatment based on the grand mean, which is the mean of the variable of interest. where y is the effect on group j of treatment τ_1, while μ is the grand mean (i.e. 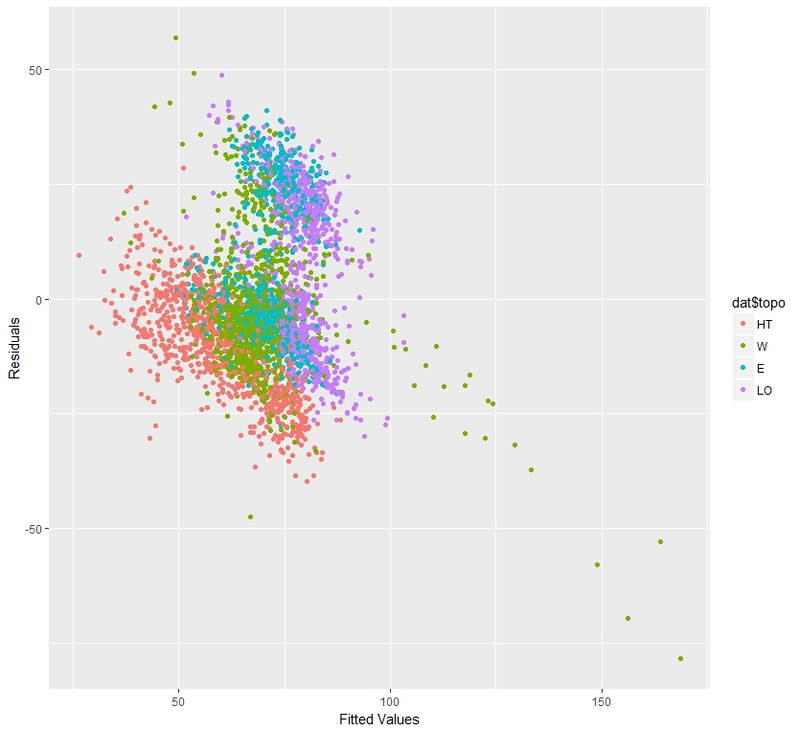 the mean of the whole dataset). From this equation is clear that the effects calculated by the ANOVA are not referred to unit changes in the explanatory variables, but are all related to changes on the grand mean. We also need to include other packages for the examples below. If some of these are not installed in your system please use again the function install.packages (replacing the name within quotation marks according to your needs) to install them. Now we can load the dataset lasrosas.corn, which has more that 3400 observations of corn yield in a field in Argentina, plus several explanatory variables both factorial (or categorical) and continuous. Important for the purpose of this tutorial is the target variable yield, which is what we are trying to model, and the explanatory variables: topo (topographic factor), bv (brightness value, which is a proxy for low organic matter content) and nf (factorial nitrogen levels). In addition we have rep, which is the blocking factor. Normality of the error term (i.e. residuals). Normality of the response variable is a contested point and not all authors agree with this. In my reading I found some author explicitly talk about normality of the response variable, while others only talk about normality of the errors. In the R Book the author states as assumption only normality of error, but says that the ANOVA can be applied to random variables, which in a way should imply normality of the response. Let’s see how we can test for them in R. Clearly we are talking about environmental data so the assumption of independence is not met, because data are autocorrelated with distance. Theoretically speaking, for spatial data ANOVA cannot be employed and more robust methods should be employed (e.g. REML); however, over the years it has been widely used for analysis of environmental data and it is accepted by the community. That does not mean that it is the correct method though, and later on in this tutorial we will see the function to perform linear modelling with REML. According to Webster and Oliver (2007) is the skewness is below 0.5, we can consider the deviation from normality not big enough to transform the data. Moreover, according to Witte and Witte (2009) if we have more than 10 samples per group we should not worry too much about violating the assumption of normality or equality of variances. As you can see we have definitely more than 10 samples per group, but our design is not balanced (i.e. some groups have more samples). This implies that the normal ANOVA cannot be used, this is because the standard way of calculating the sum of squares is not appropriate for unbalanced designs (look here for more info: http://goanna.cs.rmit.edu.au/~fscholer/anova.php). The same function tapply can be used to check the assumption of equality of variances. We just need to replace the function length with the function var for the option FUN. In summary, even though from the descriptive analysis it appears that our data are close to being normal and have equal variance, our design is unbalanced, therefore the normal way of doing ANOVA cannot be used. In other words we cannot function aov for this dataset. However, since this is a tutorial we are still going to start by applying the normal ANOVA with aov. By plotting our data we can start figuring out what is the interaction between nitrogen levels and yield. In particular, there is an increase in yield with higher level of nitrogen. 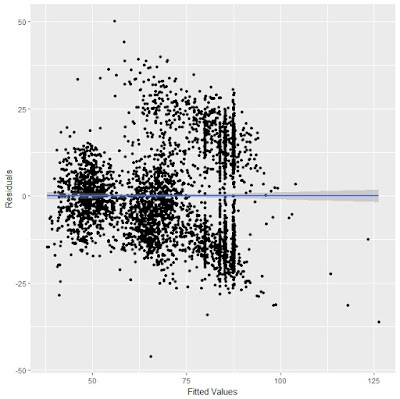 However, some of the error bars are overlapping, and this may suggest that their values are not significantly different. For example, by looking at this plot N0 and N1 have error bars very close to overlap, but probably not overlapping, so it may be that N1 provides a significant different from N0. The rest are all probably significantly different from N0. For the rest their interval overlap most of the times, so their differences would probably not be significant. There are significant differences between the control and the rest of the levels of nitrogen, plus other differences between N4 and N5 compared to N1, but nothing else. 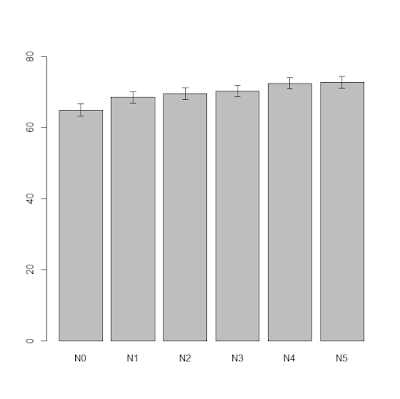 If you look back at the bar chart we produced before, and look carefully at the overlaps between error bars, you will see that for example N1, N2, and N3 have overlapping error bars, thus they are not significantly different. On the contrary, N1 has no overlaps with either N4 and N5 , which is what we demonstrated in the ANOVA. For certain datasets the assumption of normality cannot be met. In such cases we may consider different options, GLM is one of them and it should be a good solution for datasets like counts and proportions. Another option could be to transform the data to normalize them and therefore meet the assumption of normality. However, with transformations we need to be extremely careful because the estimates of the slopes will also be transformed, and so we always need to know how to back-transform our data. The final option would be to use nonparametric tests, which do not assume a normal distribution. The p-value is very low, which means the nf treatments are significant. The same results can be obtain by fitting a linear model with the function lm, only their interpretation would be different. The assumption for fitting a linear models are again independence (which is always violated with environmental data), and normality. There are several information in this table that we should clarify. First of all it already provides with some descriptive measures for the residuals, from which we can see that their distribution is relatively normal (first and last quartiles have similar but opposite values and the same is true for minimum and maximum). As you remember when we talked about assumptions, one was that the error term is normal. This first part of the output allows us to check whether we are meeting this assumption. Other important information we should look at are the R-squared and Adjusted R-squared (please look at the end of the page to know more about these two values). 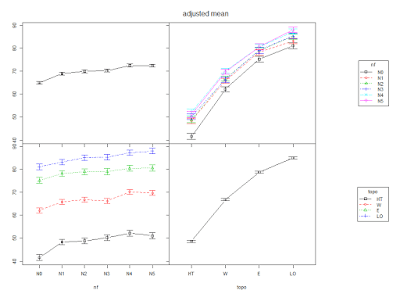 In essence, R-squared tells us how much variance in the data can be explained by the model, in this case not much. 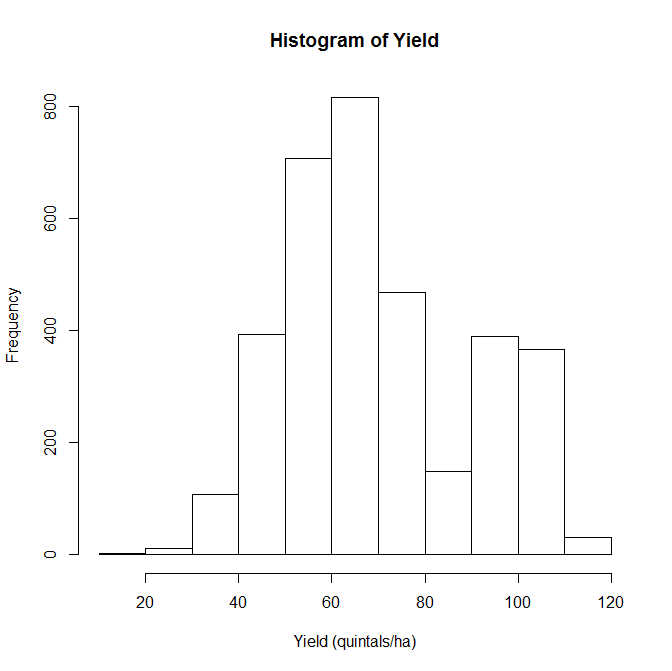 However, this is an exploratory rather than a predictive model, so we know that there may be other factors that affect the variability of yield, but we are not interested in them. We are only interested in understanding in the impact of the level of nitrogen. Another important information is the F-statistics at the end, with the p-value (which is very low). The F-statistic is the ration between the variability between groups (meaning between different level of N) and within groups (meaning the variability with samples with the same value of N). 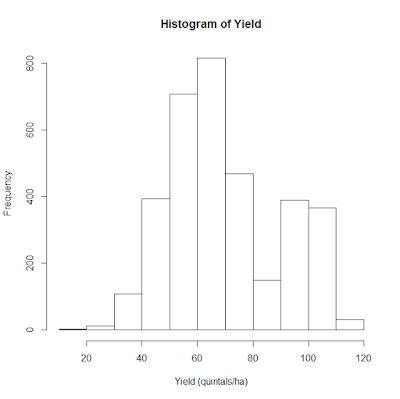 This ratio and the related p-value tell us that our model is significant (because the variability that we obtain increasing N is higher that the normal variability we expect from random variation), which means that nitrogen has an effect on yield. Another important element about coefficients is that there measuring unit is the same as the dependent variable, because it provides an estimate of the effect of a predictor to the dependent variable, i.e. yield. As you can see the level N0 is not shown in the list; this is called the reference level, which means that all the other are referenced back to it. In other words, the value of the intercept is the mean of nitrogen level 0 (in fact is the same we calculated above 64.97). To calculate the means for the other groups we need to sum the value of the reference level with the slopes. For example N1 is 64.97 + 3.64 = 68.61 (the same calculated from the ANOVA). The p-value and the significance are again in relation to the reference level, meaning for example that N1 is significantly different from N0 (reference level) and the p-value is 0.0017. This is similar to the Tukey’s test we performed above, but it is only valid in relation to N0. As you can see the p-value is computed from the t-statistic, this is because R computes t-test comparing all the factors to the reference level. Now the reference level is N1, so all the results will tell us the effects of nitrogen in relation to N1. 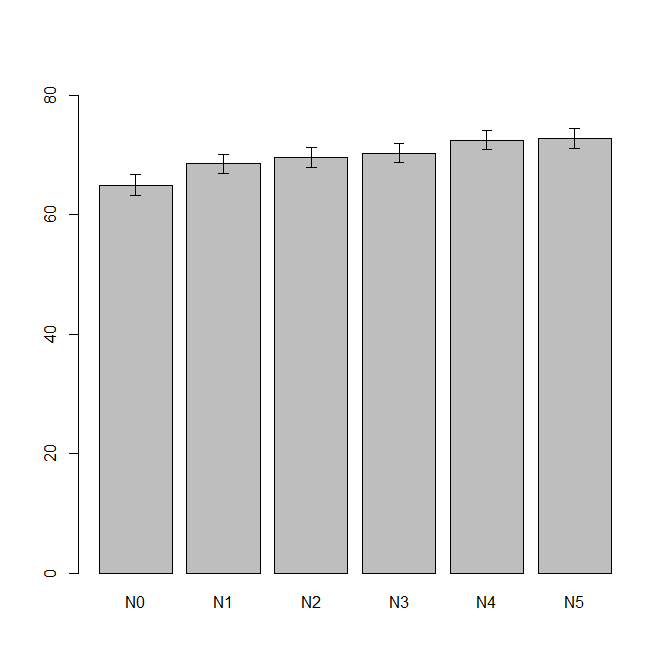 For example, we can see that N0 has a lower value compared to N1, and that only N0, N4 and N5 are significantly different from N1, which is what we saw from the bar chart and what we found from the Tukey’s test. Interpreting the output of the function aov is much easier compare to lm. However, in many cases we can only use the function lm (for example in an ANCOVA where alongside categorical we have continuous explanatory variables) so it is important that we learn how to interpret its summary table. In this example the two results are the same, probably the large sample size helps in this respect. However, for smaller samples this distinction may become important. For this reason, if your design is unbalanced please remember not to use the function aov, but always lm and Anova with the option for type III sum of squares. Here we are using the same exact approach we used before to formulate an hypothesis about nitrogen. 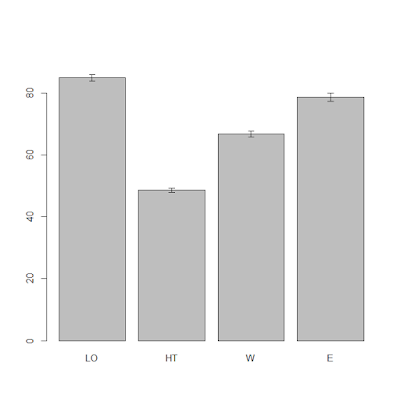 We first calculate mean and standard error of yield for each level of topo, and then plot a bar chart with error bars. From this plot it is clear that the topographic factor has an effect on yield. In particular, hilltop areas have low yield while the low east corner of the field has high yield. 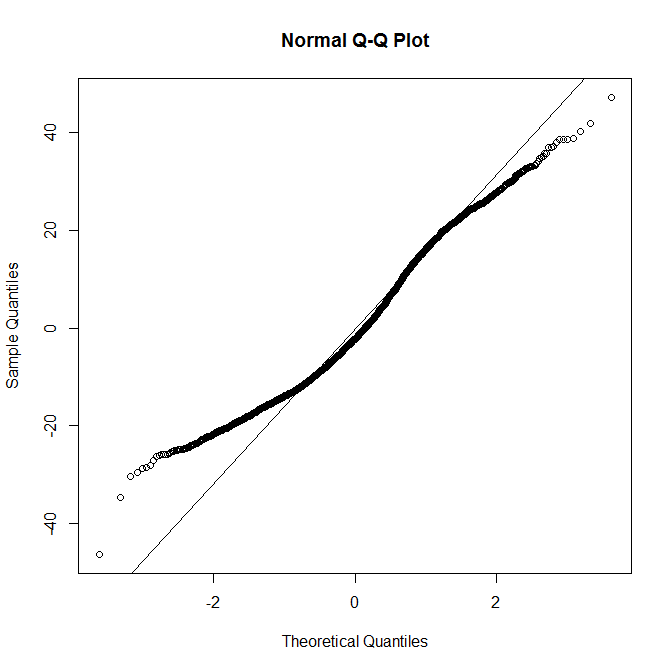 From the error bars we can say with a good level of confidence that probably all the differences will be significant, at least up to an alpha of 95% (significant level, meaning a p-value of 0.05). The zero p-values indicate a large significance for each combination, as it was clear from the plot. With the function model.table you can easily obtain a table of means or effects, if you are interested. 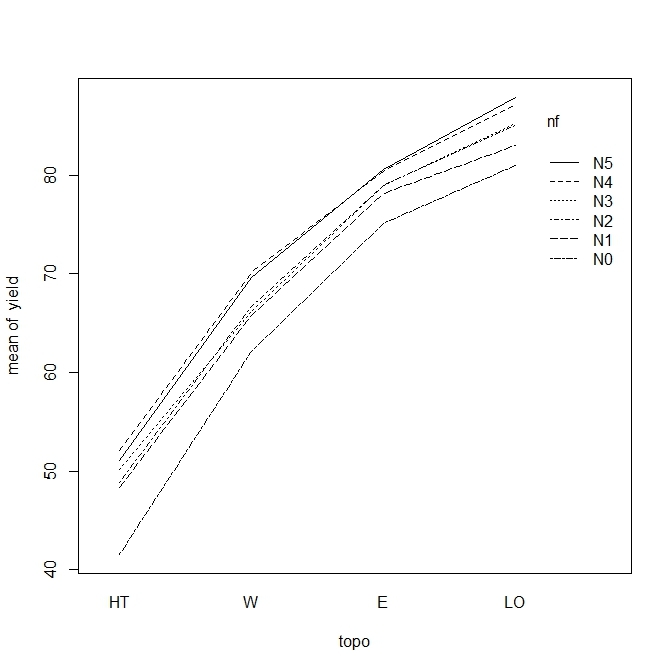 One step further we can take to get more insights into our data is add an interaction between nitrogen and topo, and see if this can further narrow down the main sources of yield variation. Once again we need to start our analysis by formulating an hypothesis. Since we are talking about an interaction we are now concern in finding a way to plot yield responses for varying nitrogen level and topographic position, so we need a 3d bar chart. We can do that with the function bar3d.ade from the package epade, so please install this package and load it. The first line is only used to reorder the levels in the factorial variable topo. This is because from the previous plot we clearly saw that HT is the one with the lowest yield, followed by W, E and LO. 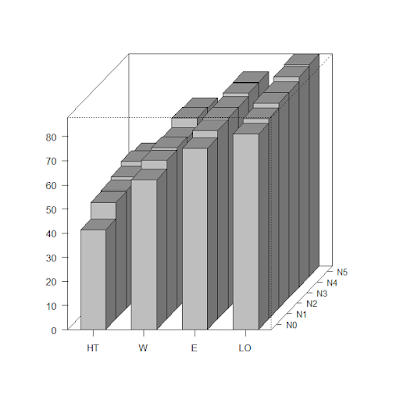 We are doing this only to make the 3d bar chart more readable. From this plot we can see two things very clearly: the first is that there is an increase in yield from HT to LO in the topographic factor, the second is that we have again and increase from N0 to N1 in the nitrogen levels. These were all expected since we already noticed them before. What we do not see in these plot is any particular influence from the interaction between topography and nitrogen. For example, if you look at HT, you have an increase in yield from N0 to N5 (expected) and overall the yield is lower than the other bars (again expected). If there was an interaction we would expect this general pattern to change, for example with relatively high yield on the hilltop at high nitrogen level, or very low yield in the low east side with N0. This does not happen and all the bars follow an expected pattern, so we can hypothesise that the interaction will not be significant. Again, all the lines increase with changes in topography, but there no additional effect provided by changes in nf. In fact, the lines never cross, or just cross slightly: this is a good indication of lack of interaction. From this we can conclude that our hypothesis was correct and that the interaction has no effect on yield. Above we looked at the Kruskal-Wallis test for nonparametric one-way ANOVA. However, there may be cases when we have more complex factorial designs and still struggle to meet the assumption of normality. As you can see the function we need to use here is raov, which stands for Robust ANOVA (Please read the book "Nonparametric statistical Methods Using R" by Kloke and McKean). The syntax is the same as for the function aov, the result table is also very similar. The only difference is that we do not have the stars to indicate significance, but we can easily work that out using the p-values. For other models we can use the function rfit, which is similar to lm in syntax and results. We already knew from the 3d plot that there is a general increase between N0 and N5 that mainly drives the changes we see in the data. However, from the top-right plot we can see that topo plays a little role between N0 and the other (in fact the black line only slightly overlap with the other), but it has no effect on N1 to N5. The table is very long so only the first lines are included. However, from this it is clear that the interaction has no effect (p-value of 1), but if it was this function can give us numerous details about the specific effects. As we can see from this output, the p-value is not significant. This means that the two model are no different in their explanatory power. This further support the fact that including an interaction does not change the accuracy of the model, and probably decreases it. We could test this last statement for example by looking at the AIC for both models, we will see how to do that later on in the tutorial. Please remember that the method we just used can be employed to compare probably all the models we are going to fit in this tutorial, so it is a very powerful method! The Analysis of covariance (ANCOVA) fits a new model where the effects of the treatments (or factorial variables) is corrected for the effect of continuous covariates, for which we can also see the effects on yield. By printing the summary table we can already see some differences compared to the model we only nitrogen as explanatory variable. The first is related to the Adjusted R-squared (which is simply the R-squared corrected for the number of predictors so that it is less affected by overfitting), which in this case is around 0.3. If we look back at the summary table of the model with only nitrogen, the R-squared was only 0.01. This means that by adding the continuous variable bv we are able to massively increase the explanatory power of the model; in fact, this new model is capable of explaining 33% of the variation in yield. Moreover, we can also see that other terms become significant, for example N3. This is because the inclusion of bv changes the entire model and its interpretation becomes less obvious compared to the simple bar chart we plotted at the beginning. The interpretation of the ANCOVA model is more complex that the one for the one-way ANOVA. In fact, the intercept value has changed and it is not the mean of the reference level N1. This is because the model now changes based on the covariate bv. The slope can be used to assess the relative impact of each term; for example, N0 has a negative impact on yield in relation to its reference level. Therefore, shifting from a nitrogen level N1 to N0 decreases the yield by -3.52, if bv is kept constant. 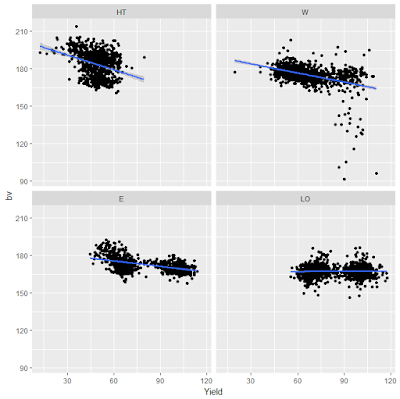 Here we are using the model (mod3) to estimate new values of yield based on set parameters. In the first example we set nf to N1 (reference level) and bv constant at 150. With the function predict we can see estimate these new values using mod3. For N1 and bv equal to 150 the yield is 96.86. In the second example we did the same but for nitrogen level N0. The result is a yield equal to 93.34, that is a difference of exactly 3.52, which is the slope of the model. For computing the ANOVA table, we can again use either the function anova (if the design is balanced) or Anova with type III (for unbalanced designs). 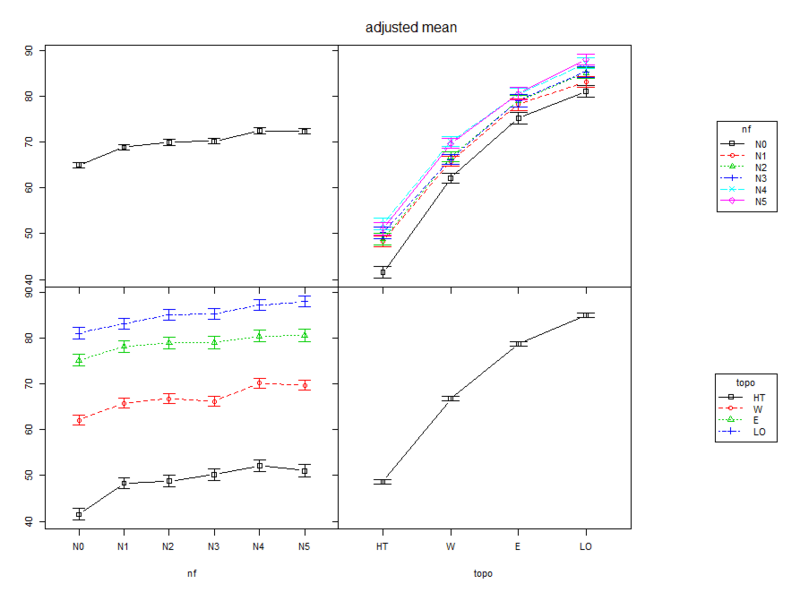 The top left plot is represents the residuals against the fitted values (or the estimates from the model). One of our assumptions was that the error term had mean equal to zero and constant variance. This means that we should see the residuals equally spread around zero. We should see a more or less horizontal line with intercept on the zero. In fact, we actually see that for low values of yield (x axis) we have a sort of equal spread around zero, but this changes with the increase in yield; this is clearly a violation of the assumption. 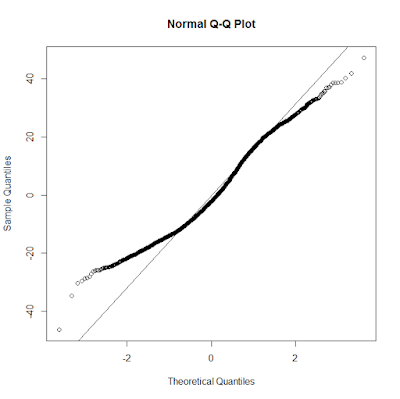 The second plot on the top represents the QQplot of the residuals, which again should be on the middle line because another assumption is that the error should be normal. Again we have some values that do not fit with normality. A good thing is that R prints the ID of these values so that we can evaluate whether we think they are outliers or we have another explanation for the violations of the assumptions. In the second row on the left we have a plot that again is used to check whether we meet the assumption of constant variance. We should again see a more or less horizontal line, but again we have an increase in variance, which violates the assumption. Finally, we have the residuals vs. leverage plot and the Cook's Distance. Leverage represents the influence of each point on the model; again we see that some points have larger influence on the model. This should not be the case, we should see again a more or less equal spread of point. Another information we can have from this plot is whether the extreme observations may be outliers. If our extreme points would lie outside the Cook's Distance zone we would suspect them to be outliers. However, in this case the zone is not even plotted because it is outside the plotting area, so we probably do not have outliers. From this image it is clear that all the points that look as possible outliers come from a specific topographic category. This may mean different things depending on the data. In this case I think it only means that we should include topo in our model. However, for other data it may mean that we should exclude certain categories, but the point I want to make is that it is always important not to look only at the summary table but try to explore the model a bit more in details to draw more meaningful conclusions. Means with the same letter are not significantly different. The results should be easy to interpret. nfN3     1.56499  0.81076  1.930  0.0537 . 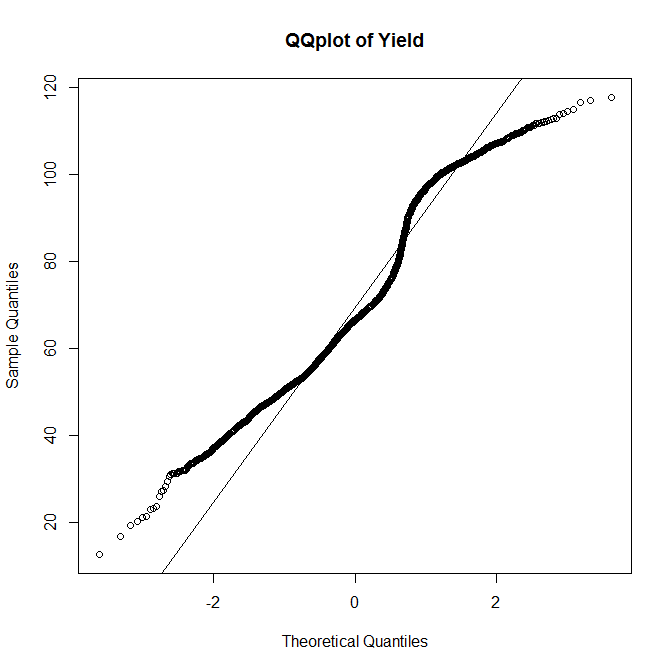 The adjusted R-squared increases again and now we are able to explain around 52% of the variation in yield. The interpretation is similar to what we said before, the only difference is that here both factors have a reference level. So for example, the effect of topoHT is related to the reference level, which is the one not shown E. So if we change the topographic position from E to HT, while keeping everything else in the model constant (meaning same value of bv and same nitrogen level), we obtain a decrease in yield of 24.12. Another thing we can see from this table is that the p-value change, and for example N3 becomes less significant. 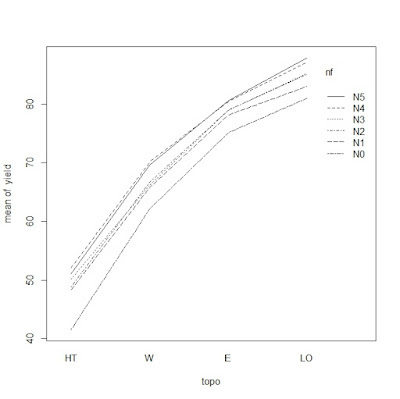 This is probably because when we consider more variables the effect of N3 on yield is explained by other variables, maybe partly bv and partly topo. It looks approximately normal, but to have a further confirmation we can use again the function skewness, which returns a value below 0.5, so we can consider this a normal distribution. 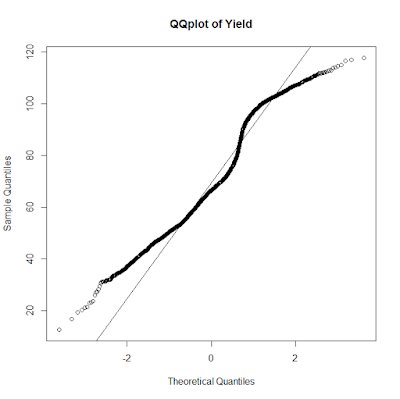 The R-squared is a bit higher, which means that we can explain more of the variability in yield by adding the interaction. For the interpretation, once again everything is related to the reference levels in the factors, even the interaction. So for example, bv:topoW tells us that the interaction between bv and topo changes the yield negatively if we change from HT to W, keeping everything else constant. For information about individual changes we would need to use the model to estimate new data as we did for mod3. As we mentioned, there are certain assumptions we need to check before starting an analysis with linear models. Assumptions about normality and equality of variance can be relaxed, particularly if sample sizes are large enough. However, other assumptions for example balance in the design and independence tend to be stricter, and we need to be careful in violating them. We can check for independence by looking at the correlation between predictors and coefficient directly in the summary table. We do that because we need to check the independence of the error (i.e. the residuals). If residuals are independent the correlation will be low. If we exclude the interaction, which would clearly be correlated with the single covariates, the rest of the coefficients are not much correlated. From this we may conclude that our assumption of independence holds true for this dataset. As you can see the line is horizontal, which means the residuals have no trend. Moreover, their spread is more or less constant for the whole range of fitted values. As you remember we assume the error term of the linear model to have zero mean and constant variance. For both these reason I think we can consider that the model meets both assumptions. However, if we color the points based on the variable topo (which is not shown but it is very easy to do with the option col in qplot) we can see that the 3-4 smaller clouds we see in the plot above are produced by particular topographical categories. This coupled with the fact that our data are probably autocorrelated, since they are sampled in space, may let us conclude that we should not assume independence and therefore GLS would be the best method. As you can see despite the different function (gls instead of lm), the rest of the syntax is the same as before. We can still use the function Anova to print the ANOVA table and summary to check the individual coefficients. The indexes AIC, BIC and logLik are all used to check the accuracy of the model and should be as low as possible. For more info please look at the appendix about assessing the accuracy of our model. Finch, W.H., Bolin, J.E. and Kelley, K., 2014. Multilevel modeling using R. Crc Press. Yan, X. and Su, X., 2009. Linear regression analysis: theory and computing. World Scientific. Webster, R. and Oliver, M.A., 2007. Geostatistics for environmental scientists. John Wiley & Sons. West, B.T., Galecki, A.T. and Welch, K.B., 2014. Linear mixed models. CRC Press. Gałecki, A. and Burzykowski, T., 2013. 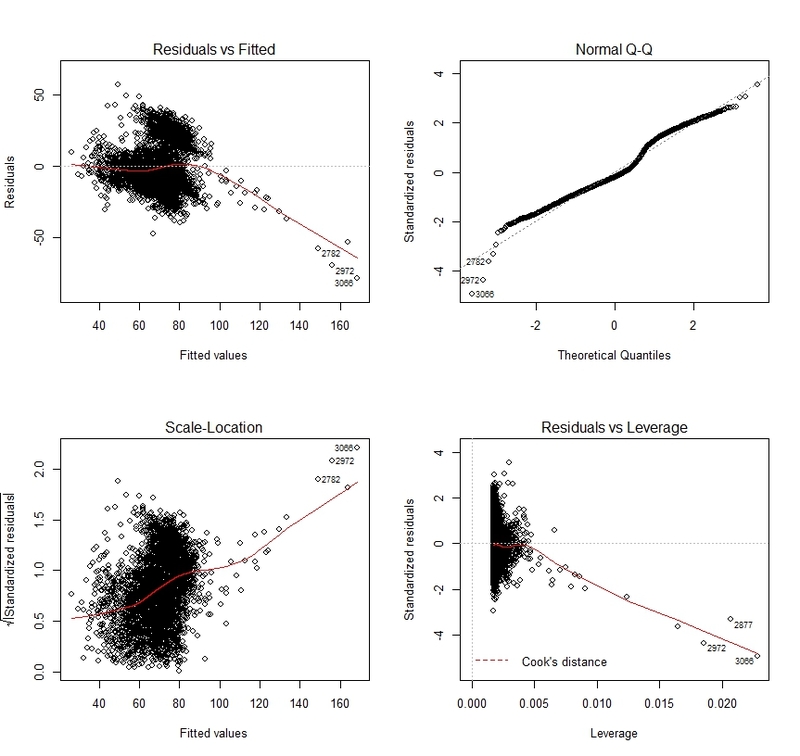 Linear mixed-effects models using R: A step-by-step approach. Springer Science & Business Media. Witte, R. and Witte, J. 2009. Statistics. 9th ed. Wiley. You should not be checking for normality of the response, yield, (lasrosas.corn$yield). In a linear model, the error term is supposed to be normally distributed with zero mean. The response has mean Xbeta. The methods (hist, qqnorm) you use to assess normality of the response assume a constant mean. You should apply those techniques to the residuals. Thank you very much for reading my post and for your comment. You are right to mention the normality of the residuals and I show the code to do that when I talk about two-factors ANOVA. In regards to the normality of the response, it is my understanding that this is one of the assumption of ANOVA. In Witte and Witte the authors say, under the section Assumptions: "All Underlying populations are assumed to be normally distributed, with equal variances". I agree with Stephen. A lot of stuff makes it into scholarly books. I think it stems from some early confusion with the shape of a sampling distribution. The authors mentioned above are not the only ones. Imagine the distribution of shoe sizes in the population. I assume those are not distributed normally, since women -even this of the same height as men- seem to have smaller shoe sizes. The distribution seems to be some kind of bimodal in the population. Having height as a predictor will produce a weaker residual fit than a model that includes gender as well and reaches an even better distribution of the residuals, when the interaction is included. Comments of this kind to text book authors usually yielded an answer like: "Well, thinking of it..." or they referred me to the textbooks where they had learned it from. Thank you for the comment. I love this discussion because it is one of the thing that confused me when I was collecting data to write the post. I wonder if by "all underlying population" they mean normality within groups, so split between men and women and then check for normality separately. My comment is also on one of the assumptions of the linear model. You mention the independence of the data, andI believe that when we talk about the independence of the data we talk about the independence of the explanation variables vs the response variable. But you tested independence on the coefficients. In fact, you do that using the "correlation of coefficients" what is new to me, and I cannot understand. Coefficients are constants, how is that correlation calculated? Would really appreciate if you could help me understand it. My second comment is another question, on the random intercept and slope for repeated measures you include on model lme2 the variable year, why? don't you want only the random effect? this way you get also a fixed effect for year, don't you? Thank you for your post and in advance for your help. These two documents should answer your questions. However, if you still have doubts please do not hesitate to continue the conversation. I found very helpful and thank for sharing. Could you share us the script you've used to to create the 3d bar in briefing two way interaction. I have one question about result intercept in Anova function lm with one factor - what does the intercept indicate or represent for?